Vox Lux is an artsy, flash and sizzle take on the pitfalls of celebrity. It’s initially gripping. Told in several acts, the first one grabs you like a peregrine falcon snatches a rabbit. The film then becomes overblown and gaudy, on purpose; hammering in its message ad nauseum. Whatever interest Vox Lux earns peters away by the tiresome climax. Style never trumps substance, no matter how earnest the delivery. 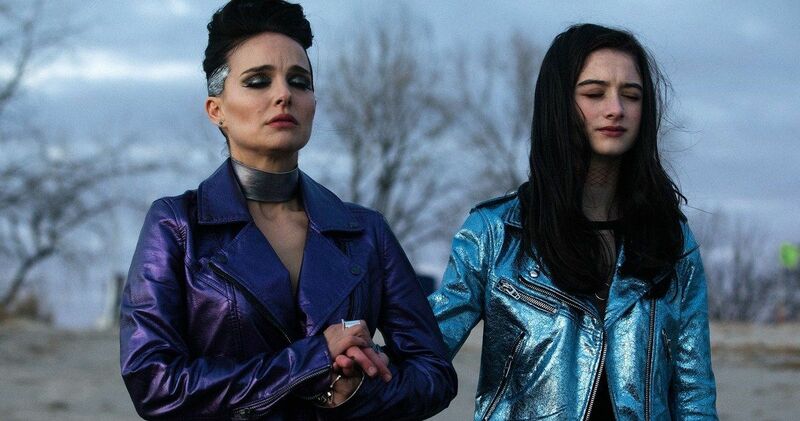 Vox Lux opens in working class Staten Island, New York before the millennium. A waif thin teenage girl, Celeste (Raffey Cassidy), is injured in a horrific school shooting. She spends her recovery writing songs in the hospital with her devoted older sister, Ellie (Stacy Martin). At the funeral for her classmates, Celeste sings a tribute written by her and Ellie. The nation is transfixed by her music and struggle. Her parents hire a manager (Jude Law) to explore all possibilities. Natalie Portman stars as the adult Celeste. Eighteen years after the incident, she has become a megastar. The shy, introspective girl has blossomed into a full blown diva. Drugs, temper tantrums, paparazzi incidents, Celeste is the epitome of a celebrity cliche. After several years recording, Celeste plans a huge debut concert in Staten Island for her latest album, Vox Lux. But the passage of time and her obnoxious personality has taken its toll on her family. Celeste has become estranged from Ellie, and her teenage daughter, also played by Raffey Cassidy. The triumphant homecoming is marked by an all too familiar tragedy. Celeste is forced to address the events that forged her fame. The beginning of Vox Lux establishes an intriguing premise. An ordinary girl survives tragedy and takes the first steps to pop stardom. British actress Raffey Cassidy is quite effective as the young Celeste. She exudes normalcy, an innocent thrust into the spotlight. The scenes between Raffey Cassidy and Stacy Martin are believable, empathetic. The sisters are embarking on a grand adventure. The thundering, dark orchestral score by Scott Walker, a foreshadowing of the peril to come. If only the film could have built on the first act without resorting to contrivance. Natalie Portman’s grownup Celeste is essentially a tawdry Lady Gaga impersonation. Director/writer Brady Corbet cranks up the volume for cynicism. Everything about Celeste is loud, selfish, and destructive. Her cringeworthy New York accent sounds like a dock worker on meth. She’s a trainwreck, but like the pop stars Corbet’s mocking; can get it in gear to lip synch gloriously for her fawning fawnbase. Portman, an actress who thrives in subtle performances; goes full throttle in her skin-tight sequin jumpsuits. Yes, we understand the monster Celeste has become, Brady Corbet bludgeons with her character. Scott Walker’s score devolves into a jumble of synth noise with the god awful pop songs. From Neon Pictures, Vox Lux lost my attention and grated by nerves. Celeste’s journey to celebrity becomes an annoying chore to sit through. Young Raffey Cassidy is far more interesting than her Oscar winning costar. Celeste discovering fame was a better story to tell.